A peddler sets up shop in the fictional sultanate of Agrabah, offering to tell the audience about the story of an oil lamp in his possession. Jafar, the Grand Vizier of the Sultan, and his parrot Iago, seek the lamp hidden within the Cave of Wonders but are told that only a “diamond in the rough” may enter. Jafar identifies a street urchin named Aladdin as worthy. Aladdin and his pet monkey, Abu, cross paths with Princess Jasmine, who has run away from the palace, unwilling to be betroth to yet another snobbish suitor. 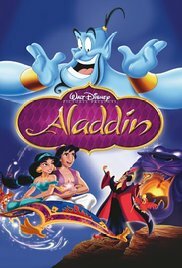 Aladdin and Jasmine become friends and fall in love, but Jafar has Aladdin apprehended, tricking Jasmine into thinking that he has been decapitated. Read more on Wikipedia.